Blue Ridge is a cozy mountain town only 90 miles north of Atlanta. Although close in proximity to the 'real world' you'll feel miles and miles away from it all. Located in the Chattahoochee National Forest Blue Ridge is a perfect place to visit to enjoy various outdoor activities such as hiking, fishing, and rafting to name a few but also to escape in a cozy cabin and catch up on that reading list! 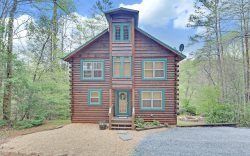 Georgia Mountain Cabins has many properties throughout the area that are sure to meet your all your needs. Please contact us today to book your next Blue Ridge cabin rental! Traveling to Blue Ridge is fairly easy however can pose some issue during winter. Be sure to travel prepared for snowy/icy conditions during the winter.